COPD is a group of progressive lung diseases that can leave people breathless (called dyspnea) and fatigued due to the inability to breathe well. COPD is most often caused by smoking or exposure to chemical irritants, and is incurable, although there are multiple treatments available to help suffers live successful lives. The 2 most common types of COPD are bronchitis and emphysema. With emphysema, the air sacs no longer return to their original shape as the space between them grows larger. With fewer or poorly functioning air sacs, your lungs cannot process enough air exchange, and the reduced capacity compromises your ability to breathe effectively. With bronchitis, the airways can also become swollen or thicker than normal due to irritation, and mucus production may increase. The limp airways are blocked or obstructed, making it even harder to exhale air from the lungs. Chronic coughing is another side effect from COPD. Just because you suffer from COPD doesn’t mean you cannot exercise. In fact, the best way to maintain your lung function is by participating in various forms of physical activity. From walking to swimming, bicycling to yoga, provided you are not working so hard that the lungs cannot keep up, causing a flare up of COPD symptom. Yoga is particularly good for COPD patients since it focuses on controlled breathing and yogic breathing contains some of the breathing exercises which are done during respiratory therapy. This statement goes without saying; smoking damages the lungs and the sooner you stop damaging your lungs, the better recovery you can expect. There are countless smoking secession tools available to those who are struggling to quit. COPD-weakened lungs are particularly vulnerable to environmental pollution. Heed air quality warnings and avoid situations (open campfires, dust and chemical fumes) where the air quality is expected to be low. This common exercise involves inhaling through the nose and exhaling through the mouth while pursing the lips, at rate of at least half the speed of the inhalation breath. This method keeps the airways open longer, reduces the wok of breathing and improves the oxygen/carbon dioxide exchange. Mentioned in our previous blog (link), this type of breathing engages the respiratory musculature, including the diaphragm, and intercostals. 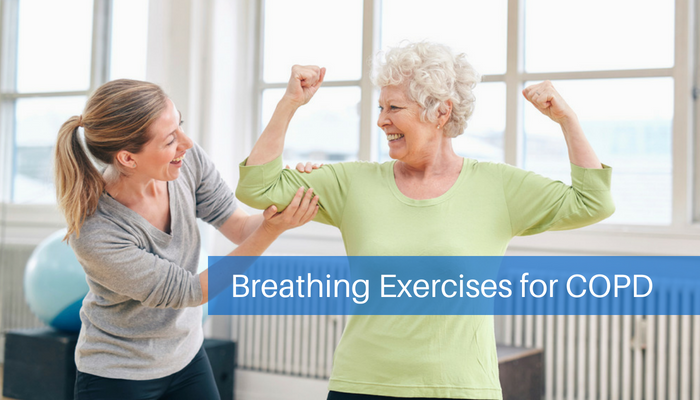 If you are currently in respiratory therapy for COPD, ask your therapist to show you how to perform this exercise; to try this at home, lie down and place one hand on your belly and one on your chest. As you exhale, the hand on your belly should lower, while your hand should rise when you inhale. This exercise is particularly useful for reducing dyspnea when exercising or doing more strenuous daily activities, such as climbing stairs or lifting heavy objects. In 2007, researchers at the University of Modena (Italy) found significant increases of strength and endurance and a reduction of dyspnea at rest and during exercise when utilizing a respiratory muscle training device like the PowerLung. An RMT device is used by athletes for increasing endurance for cardiovascular exercise to improve oxygen use by reducing the amount of oxygen. Therefore, it would make sense for COPD patients to utilize this type of training device for strengthening respiratory muscles, reducing their need for oxygen and thus improving lung function. The PowerLung device, with multiple models and options to customize your respiratory training plams, is perfectly suited to meet the needs of athletes, musicians, and even respiratory disease patients! PowerLung provides several training exercises to help users maximize their device, from the first few sessions through years of use! This is one of the best workouts for those new to using the device. As you begin to see results with the device in short 10-minute routines, you can build your exercise routine to include more challenging levels. PowerLung is the only breathing device that exercises all the muscles you use to breathe by engaging resistance both on inhale and exhale. Consider adding a respiratory training device like PowerLung to your everyday schedule.